The Toffee’s made two changes from the limp FA Cup exit with Jelavic and Neville carrying the can and replaced by Anichebe and Gibson. City looked to combat our aerial assault by conceding the flanks and overloading in central zones with three centre halves Kolo Toure, Nastasic and Zabaleta. On the left, Kolorov made his first start since the last game against us back in December in place of Clichy presumably for his height and delivery as we will usually push City out to the flanks. On the right, vanilla flavoured James Milner has started the last 3 at Goodison in an attempt to reign in Baines mischief so it was equally unsurprising that he was deployed here from the start. The Toffee’s used a ‘contract and expand’ type approach to this match; when City had the ball we formed a compact block and when possession was regained we’d make the pitch as large as possible with Coleman and Baines pushing right up field. Coleman was the out-ball throughout with Gibson (7) and Mucha (6) feeding the full back most frequently. We know City would look to play through the middle so when we lost the ball our players would shrink the middle of the pitch with wide players tucking inside and closing off passing angles to the likes of Silva and Tevez who increasingly had to funnel across to wide areas to pick up passes. Southampton make the most interceptions in the top flight with an average of 19.9 per game however yesterday we made a whopping 26 with the below visual showing how predominantly they came in-field and not down the flanks with the clearly ace Gibson (7) making the most. The game’s opening goal came after some patient build up play by the Blues with Osman switching play from left to right, feeding the excellent Seamus Coleman. The Irishman moved the ball inside for Osman and with City standing off him – as they did later for the Jelavic goal – the pint sized schemer was able to pop a cracker into the top corner of block headed gaming enthusiast Joe Hart’s net. Mancini then switched to a back four prior to half time with Zabaleta pushing out to right back, Milner pushing into midfield and Silva moving to left midfield. With a man disadvantage, Operation Goodison lockdown commenced with more of a focus on the defensive game than the previous full throttle attacking overload from the first half. Moyes withdrew Fellaini into a deeper midfield role and Osman pushed out to the left flank with Anichebe thus increasingly isolated, feeding predominantly of long balls which he did superbly. The less dynamic Naismith was brought on for Mirallas presumably for his better defensive capabilities particularly as an aerial outlet. Credit must go to the much maligned Scot as his industry was crucial in winning the ball back for Fellaini to tee up Jelavic for goal two. City brought on Nasri to play through the middle in place of the awful Gareth Barry in a bid to give their passing a bit more depth and incision which worked to an extent. City unsurprisingly swelled possession in the last 30 mins and with more space to manoeuvre in the centre of the pitch for the likes of Silva and Nasri chances became more frequent with 9 of their 17 opportunities coming within this time period. As the game developed we relied increasingly on the lion hearted running of Seamus Coleman, who made more successful dribble than anyone on the pitch. Goodness knows what slow releasing energy foodstuffs they feed the young wingback at Finch Farm for his breakfast. With most players dead on their feet in the dying embers of the battle, Coleman’s late bursts where the football equivalent of a withered clubber re-energised at dawn courtesy of an ill judged double drop of love beans. Alexsander Kolorov will certainly be happy to see the back of him. Just as last week was a microcosm of the negative aspects of Moyes, today provided a reminder of the good things with hard work, bloody minded determination combined with quality and a streetwise cunning in the important zones. 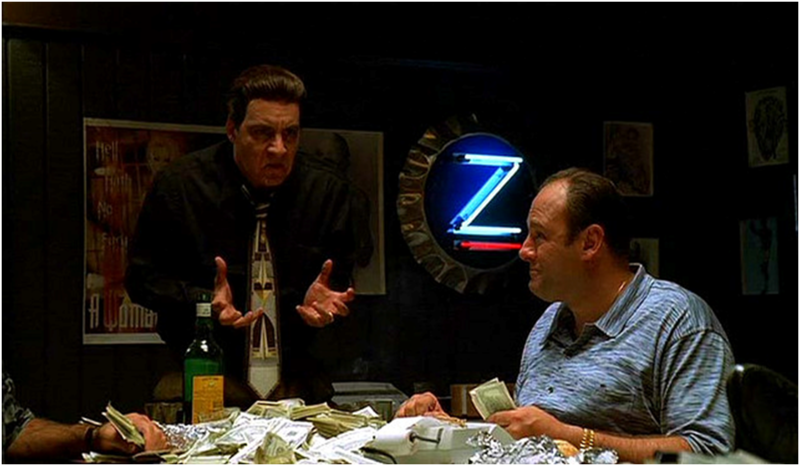 For Mancini, Everton will always be his ‘laces out’ Ray Finkle moment. The Italian spoke after the 1-1 draw in December about how there is ‘no solution’ to playing Everton. He must feel like a man banging his head against a brick wall as everything he tried failed. This time out he went with 3 centre backs, then switched to a back four and then back to a back 3 in the final period of the game. The formations changed but whichever shape he went for City were second best in the face of an opponent fired up by the fall-out from last week. We’ve now webbed United and City this season – a feat only matched by Real Madrid – but now need to follow this up with results at rivals Chelsea, Arsenal and Spurs plus the local dispute at the Tin Mine. All the above are places we have continually failed to get points in past campaigns but which will ultimately define our season. 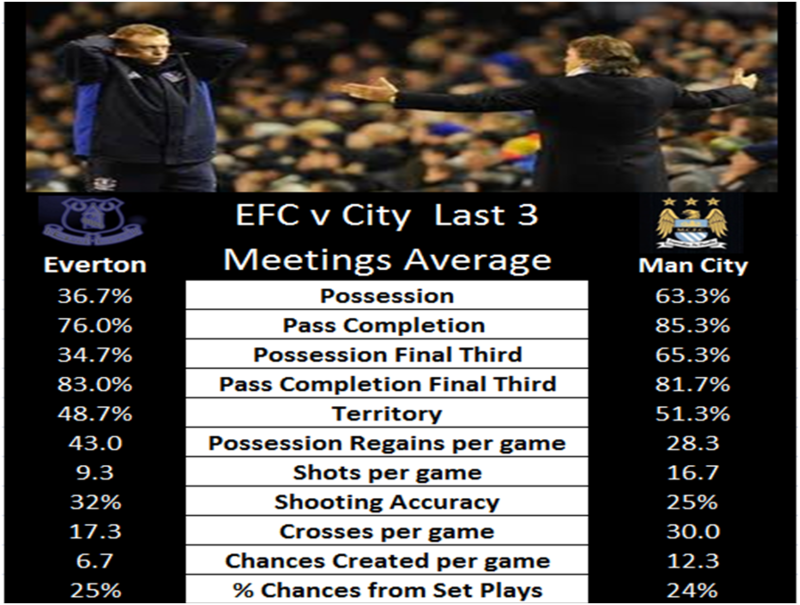 City will control the ball; Our visitors will dominate possession although it will not always be threatening possession e.g. the most frequent passing combinations in the last two games for City have been Lescott – Kompany and Yaya Toure to Barry. Toffee’s will look for territory gains; Territory wise it is something of a dead heat i.e. whilst City have all the ball it is predominantly in our half with us getting 11 men behind the ball and playing more direct from back to front. Set plays key for us; City roughly create double the amount of chances than we do, with ourselves creating a higher percentage from set plays. Blues graft will be crucial; Due to City’s possession we have always had to work harder in terms of being off the ball for longer periods. The exception to this was the last game when City regained possession more than us despite having more of the ball, a consequence of us looking to keep shape and not press as much (which could lose to us losing defensive shape). We will generally defend compact with full backs tucked in to snuff out the central areas as shown below …so we basically give City space but in wide areas where they are less threatening. The Italian’s defensive strategy is based on a defensive six (4 defenders, 2 defensive mids) When not on the ball he likes his sides to press and win it back quickly. Going forward Mancini plays a possession focused game, making sure the ball is moved around the pitch, probing for spaces to invite defences to come out to press and then exploit with a killer pass. The focus is on being quick and sharp in the counter attack and moving quickly in tight spaces going forward with fast paced players who can penetrate spaces between opposition lines and create opportunities. For example, the below shows the average positions of the teams in last season’s fixture (efc left/city right) ….the lines between our defence and midfield are the areas City’s attacking players (circled) predominantly operate and look to make gains. Comparisons with Casillas and Buffon were ridiculous but Hart is a solid performer with a good command of his area. Has kept 30 clean sheets in the Premier League since August 2011, nine more than any other ‘keeper in that period and has conceded fewer goals on the road than any top flight stopper this season. Also loves chill-axing post match down the go-cart track. Versatile performer who has been City’s most consistent player this season from right back. Great tackler, good going forward and also competent in the air. The only fly in his ointment is a propensity to get a bit too tight which has led to him making the most fouls and being dribbled past more than anyone in the City squad. Should dislodge part time car salesman Kolo Toure in the right of centre slot despite the Ivorian recently being in decent form. A genuine colossal customer both in the air and on the deck. Not the greatest defender in terms of distribution. Only slight blot on his copybook is a fondness to go to ground which has led to a few issues with referees in the last twelve months. Lescott appears on his way out of the club after losing his place to the excellent Nastasic. The ex blue is usually selected against sides with a significant aerial threat so will likely be in contention for a start in this one. The Serb has a much higher tackle completion rate and crucially unlike Lescott can pass the ball; Nastasic has completed 33% more passes per game and is particularly good in terms of long range passing, making 4.3 successful long passes per game to lescott’s 1.3. An excellent tackler with great mobility. at 5’9 he’s the same height as Pablo Zabaleta but is less capable in the air winning less than half his aerial duels. Can at times be targeted by opposition managers as a weak link so expect Heitinga/Gibson to loft balls in his direction towards Fellaini. The archetype English player with the exception of being tee total. Usually deployed on the right of midfield to track baines, started the last 2 games at goodison before being subbed off both times after City have fallen behind. 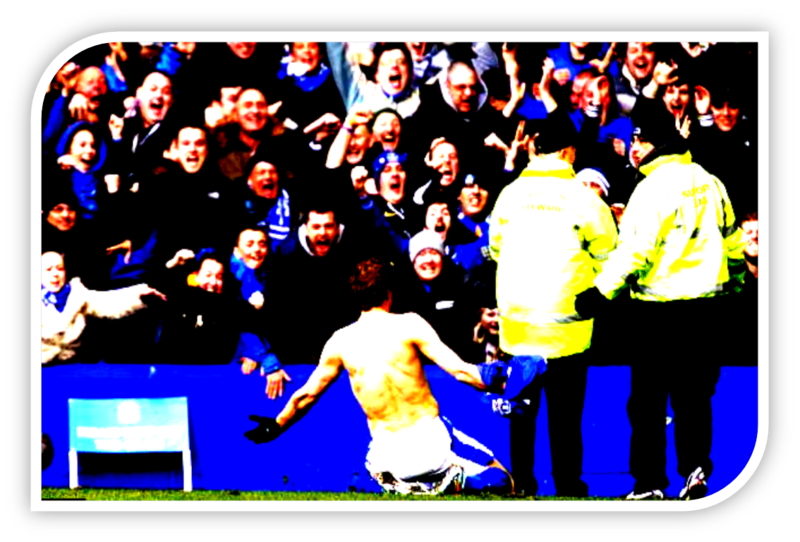 Grafter who is more notable for his ability off the ball than on it…will give you a wet shirt at the end of the game. Once had a trial with the toffees and looks like a right laugh off the pitch. Rightfully lauded as the lynchpin of the side. Last time was restricted from making his trademark forward surges due to picking up Fellaini further back particularly from Howard kick outs. Will most likely have a similar brief in this game. Hopefully he has an off day. Much better than Gareth Barry. Ex Benfica and Real Madrid midfielder and occasional centre back. Is good in the air and can move the ball well. Is susceptible to being beaten for pace. We’ll need to watch this cat. The key mischief-maker who averages a chance created every 26 minutes in the top flight this season. Notably struggles in these encounters with our restriction of space through the middle. Failed to create a single chance in the game at the Etihad this season and was man marked out of the game by Rodwell last season. Not as sharp going towards his own goal and was chastised by Mancini for not tracking Baines run in the first half in the move which led to Fellaini goal earlier this season. Vile no necked sub humanTevez has been mostly the support striker this season, leading to him assisting 7 goals – the joint highest with Silva. Generally has struggled against us in the past and has not scored in open play in 11 games vs everton for 3 different clubs. Better to keep him on his left peg with 87% of his goals this season coming from his right foot. The nailed on starter for City; always plays against us when fit due to his physicality and will pick up Fellaini from set pieces. Predominantly right footed forward who has also never scored against Everton. The Toffees team was the same as that which drew with Arsenal in midweek with City’s line-up providing more interest tactically. It says something of the threat we carry when the Champions change their team selection significantly at home specifically to deal with the threat we carry. Despite an impressive run of clean sheets, Mancini broke up the defensive centre of Kompany and Nastasic to recall his best aerial stopper, ex-toffee Joleon Lescott whilst key man Aguero was left out. When the Argentine was introduced it was top scorer Carlos Tevez who made way and not Dzeko. The Bosnian has a reputation as a ‘superb sub’ but is consistently selected against us from the start for his aerial ability in defending set plays.Post match Mancini said “You need your attackers to help you defend, especially when you play a team like Everton who are good at set pieces.” Yaya Toure, who is often moved further forward later on in games when City are chasing games as a more direct option, was also held back to a more withdrawn role which included marking duties on Fellaini from Tim Howard’s goal kicks. Our defensive approach was all about shape and making the pitch as small as possible. We didn’t really press our opponents; despite spending more time on the ball Man City made 50 pressing contacts (tackles, fouls and interceptions) compared to our 31. You would usually expect the opposite when a team has more of the ball like City. Mancini’s post match rants about us are now customary but there is clear praise if you delve a bit deeper into his comments. Post match the Italian talked about ‘no team’ being able to defend better than the Blues in the league, leading him to propose that there is ‘maybe no solution’ to break us down. 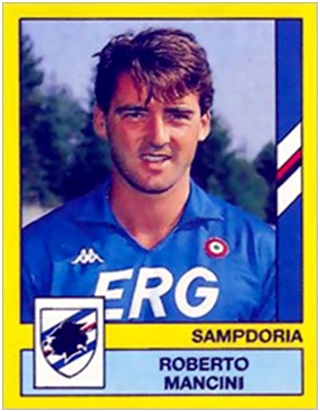 High praise from an Italian coach well versed in the concept of catenaccio. Regulars will be familiar with our defensive approach against City and there was little new this time round. When out of possession our full backs tucked in, making the pitch as small as possible and forming a wall protecting the 18 yard box. The above visual shows this pretty well as City build a move from the back with Maicon the only out ball. City failed to create much from the 30+ crosses they swung in as we packed the box and won the bulk of the aerial duels. A fusion of the quick speed it takes us to re-form this shape when possession is lost coupled with City’s often pedestrian build up produced a familiar end product; City controlled the ball in the middle ground with limited incision, creating pretty much the same as us in terms of clear cut chances. This was reflected by the fact that City’s most common passing combination was Gareth Barry/Yaya Toure, with the duo exchanging 28 passes in keeping with City’s often pedestrian paced build up. City dominated the ball as they usually do against us, with 59% of possession but only 51% of the territory, a sign that most of their possession was in the middle third of the pitch as mentioned above. We had more of the ball than last season’s encounter at Eastlands, making 42 more passes with 29 additional forward passes to last season’s total. In the first period our attack was a match for City’s whereas in the second we dropped off and allowed City more of the ball. Whilst it’s not cool to say anything bad about Yaya Toure, the Ivorian had a pretty gash game here. Tasked with keeping Fellaini in check by any means necessary, in the build up to our goal he whacked the Belgian three times with no foul given. Only when Barry took Fellaini out at waist height did the referee blow for a foul. It was a good example of how the Belgian attracts 2/3 players at a time which creates space for others. From the resulting free kick, City get the ball back before Toure loses possession enabling the ace Gibson to intercept and feed Baines to whip in a trademark delivery. As he does excellently, Fellaini pulls to the back post away from larger centre backs and onto the aerially weaker fullbacks – this time it was Zabaleta – with the Argentine having no idea where the Belgian was which allowed him to power home at the second time of asking. David Silva – a player Moyes man marked last season in this fixture – was not gives a similar shadow this time but again was completely snuffed out, failing to make any dribbles or create any chances in the 90 minutes. Silva was also given a defensive brief to assist Maicon stopping our lateral maraudings down the left flank. When Fellaini almost converted a Pienaar centre with Silva nowhere to be seen, Mancini appeared to lose his rag completely on the touchline with the duo seen exchanging moody vibes as the players trudged off for the interval. This was another interesting battle between Moyes and Mancini. Our approach was similar to recent seasons although we offered more going forward this time with a higher share of the ball. Our defensive shape was excellent in what was comfortably our best display of the season off the ball. A tough run of fixtures concludes next week when a win against Spurs could possibly see us rise as high as 3rd in the table – a situation most toffees would have taken at the start of this 3 game run against tasty opposition. Next up is an away trip to Manchester City to face the Champions in what promises to be another interesting tactical joust between the two rather different leaders in the respective dugouts…..
For all he has achieved in his career and at City you get the impression Mancini has a simmering anger at himself for not being able to translate City’s enormously disproportionate resources into tangible outcomes against us. Since he took the Etihad post the sides have met six times with Moyes winning five and losing just once. Amazingly, we are still the last team to win a Premier League fixture at Eastlands. In last season’s fixtures, City averaged 68% possession in the two games, in the process making roughly double the passes we did. Territory wise it was about even with our work rate to get men behind the ball when we lost possession so good that the bulk of City’s possession was predominantly outside our final third. An example of this was the game at Goodison when the most frequent passing combination from City were between Lescott and Kompany. In the game at the Etihad, Moyes chose to use Jack Rodwell as a man marker on David Silva who at the time was in scintillating form…. The assignment worked to an extent with Silva largely peripheral although the game showed that City possess so many match winners it’s hard to completely shut them down. Rodwell is of course now at City and with no real like for like replacement recruited to the Blues squad its unlikely Moyes will repeat this tactic unless he sticks Fellaini back there. 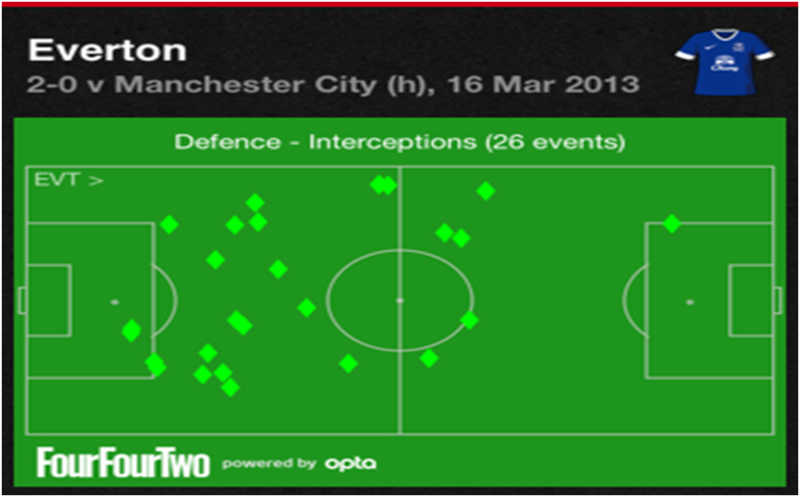 This meant we basically defended an invisible line 25 yards from our goal with virtually no pressing in City’s half as the below interceptions shows…. Indeed, our lack of legs in the middle of the park is a massive concern against a side that can wear opponents down / preserve their own fitness through their ball retention like City do. Its little surprise that last season Mancini’s side scored a higher % of late goals than any side in the top flight and this was the case last season when our resolve was finally broken with 2 late goals, one a deflection and one a gimmee after a howler from Drenthe. We showed at Goodison though that possession counts for little if you can defend doggedly and take your chance when they’re presented. This match followed a similar path to the game at the Etihad with City swelling possession but largely incapable of breaking down our makeshift centre back pairing of Hibbert / Heitinga with few clear cut chances engineered. The game was a reminder that we have the endurance to match City (we actually scored the 2nd highest % of late goals in the league last season) with the now departed Stracquilarsi and Tim Cahill both putting in massive shifts in defending from the front. Why would you expect an easy game against a side that you have consistently lost against? This was perhaps a smokescreen to take pressure of the players, either that or RM is extremely self critical. I would guess Mancini will look to play high up and negate our threat from crosses given that we make the most in the top flight. He complained following our win in 2010 at Goodison about ‘Long balls’ and his side ‘playing too deep in the second half’ when the introduction of Cahill from the bench resulted in us scoring twice in the second period to take the points. Moyes has a dilemma then. Does he stick with a winning formula in this fixture of containment and look to eek out a positive result or does he look to take City on with the ball with our new found expansive style? I’d guess the likely option would be containment. As well as being the league’s top scorers last season, a sign of their physicality was that City were also the top scorers from corners and have scored the joint most this season (10) from dead balls so Distin is a nailed on starter. Line-ups wise, Joe Hart will keep goal with a back four of Maicon & Kolorov (full backs) with Nastasic’s superior ability on the ball having displaced Lescott as a first pick and the Serbian will partner Kompany in the centre. In midfield Barry will hold with Yaya Toure and Garcia making up the midfield; Milner is usually selected against us to provide more defensive resilience against our offensive left side but is out injured. The forward players will most likely by Silva, Tevez and Aguero. Interestingly, Tevez has never scored against us for City or any of his previous clubs. With Baines hamstring problem Oviedo and probably Hibbert will start at fullback for us with Distin/Jags at CB although today’s physio blog rates both Baines and Mirallas as likely to start. Off the ball both full backs will tuck in and form a compact unit showing City out to the flanks. 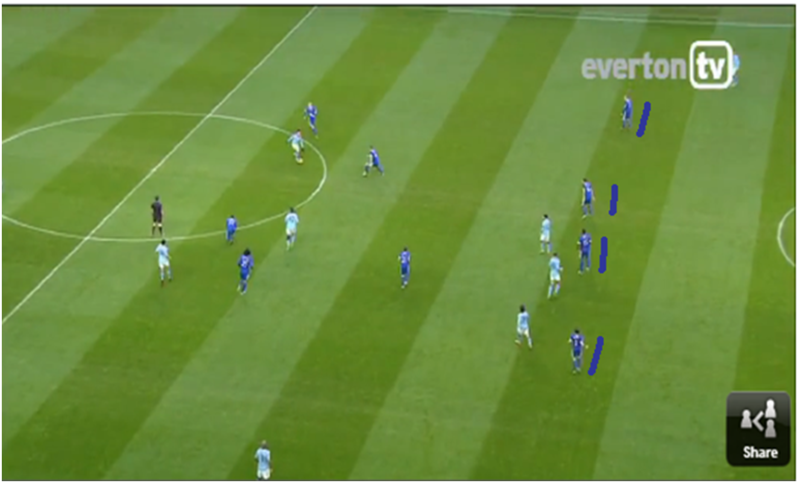 In both games last season City struggled to exploit the space in wide areas with Richards / Clichy reluctant to push on. With Maicon and Kolorov likely to start this shouldn’t be a problem this time round. In the Etihad game, Fellaini started further forward as the ‘out ball’ with the strategy being to play direct balls for him to hold up to enable us to get further up the pitch when City were boxing us in with their pressure. Moyes may choose to go with this again or use the Belgian in a more withdrawn role with Jelavic most closely supported by Pienaar centrally with Mirallas on the left. City are favourites for this one at a best price 4/7 with Bet365 with ourselves as long as 6/1 with Paddy Power. The draw is 31/10 with Bet Victor. City’s form in the league is pretty good given they are still unbeaten although have probably drawn too many for their liking. The Dortmund game in particular showed they are susceptible to quick counter attacks so the application of a fit-again Kevin Mirallas will be crucial if we are to get anything from the game. The ECL games have also showed that whilst City may have better players with the ability to win a game with individual brilliance, as a team they have less cohesion as a unit and are beatable. You can get as far as 33/1 with Betfred on a Baines Scores anytime / Everton win double, not bad considering this outcome came in the season before last and LB takes all free kicks and pens (this was written pre-injury scare on weds). can also get as long as 16/1 on a Toffees win. Both games last season were stalemates going into the later stages and you can get 16/1 with Bet365 that the opening goal will be scored between 61-70mins. 4 of the 6 recent meetings between the duo have featured under 2.5 goals with only one side scoring so I wouldn’t expect a high goals output here. Dead cert wise, with 27 yellows and 2 reds in the last 5 meetings between the sides the smart money is on 5+ cards.